There's been a whole lot of twitchin' going on at Fraser Island and, as spring draws to a close, a flutter of new life can be seen everywhere as the offspring from successful courtships go about finding their place in the island’s ecosystem. We eagerly watched as the Grey Shrike Thrush chicks, born in a nest in our Centre Complex roof (just near the hotel reception), grew to fledglings and, as young birds do, fearlessly leaped from the nest, only to land on the floor below. Eeek! Thanks to the efforts of their attentive mother continuing to bring the young ones food, and our Resort Rangers - alerting guests to the possible presence of baby birds under their feet - these chicks successfully learned to fly and eventually left the reception building to start life on Fraser. As the Bottlebrush Flowers finished for the season, we watched as the flower stems of the Grass Tree provided a rich nectar source for the island’s Honeyeaters throughout October. 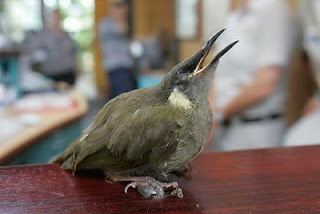 Blue-Faced and Lewin’s Honeyeaters (pictured on our Rangers' desk in Reception) were regularly seen feasting on the wild flowers down near the beach. Dusky Honeyeaters were occasionally spotted but it was the ever present White Cheeked Honeyeaters that continued to dominate morning sightings on our Early Morning Bird Walks. Down on the beach, the nesting pair of Whistling Kites produced a single chick, which proved popular with guests and staff alike during our bird walks. We followed this chick's progress with baited breath as its mother taught it to fly and to catch fish prey and to produce its stunning whistle. The air was filled with the wonderful sound of the young bird practicing on many of our mornings. With spring nearly over, the next generation of feathered friends is busy learning about life at Kingfisher Bay. A brand new season is upon us and those warmer morning temperatures should bring about some new and fantastic sightings. We look forward to sharing this with you. Season's Greetings from our resident 'Bird Nerds' Ranger Kat and Ranger Bec.